Posted on November 28, 2011 at 15:43. Connecting electronic equipment on the factory floor is an important aspect of any control system. There are several options for connecting data and power to monitors and other devices. 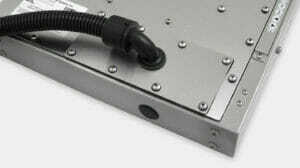 Regarding the cables themselves, there are options in cable quality, shielding, terminations, etc. There are also decisions that affect their appearance and how they are protected and sealed. Conduit provides the best method for routing, protecting, and sealing exposed cables. 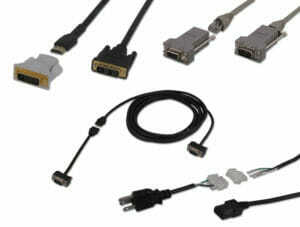 It is most used in wet and dirty environments and where cables may be exposed to physical abuse. What size does the conduit need to be? Does the conduit need to be flexible? If the conduit is flexible, how tough does it need to be? Does the conduit meet UL50E? Does the conduit achieve the environmental type rating that is needed for the application? How far is it from the monitor to the computer or video source? At Hope Industrial Systems we use a conduit type that is relatively low cost, while meeting all the stringent requirements for industrial applications. Our conduit is one of the only flexible conduits that meets UL50E requirements, and it has the independent certification to prove it. 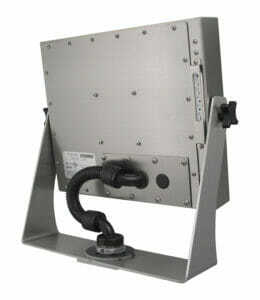 It exceeds Type 4/4X requirements and meets IP69K for water-tightness. The conduit is made of tough Nylon 6-6 and is cut and tear resistant, unlike many of its vinyl counterparts. It is ribbed for maximum flexibility for tight bends and adjusting monitor positions. The fittings have a large enough throat to handle all possible cable combinations and still be small enough to fit into tight places. 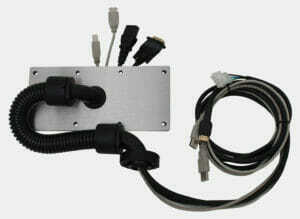 Since routing the cables can be very time consuming for the installer, we offer pre-assembled kits at standard lengths containing conduit, fittings, cables (power, video, USB, and CAT5, as needed), and a cover plate on one end that seals directly to our fully-enclosed Universal Mount Monitors (one size fits all). We also have sealed configurations of our industrial Pedestal and Yoke/Benchtop mounts that use the flexible conduit to route cables from the display to the top of the pedestal (or through the yoke/benchtop). All data cables, including VGA and power, can be routed through conduit that is only 28 mm in diameter using breakout cables. Breakout cables have a disconnect near one end of the cable to facilitate routing the cables without the large connector end getting in the way. This applies to VGA, DVI, power, and serial RS-232 cables. Conduit and cables that are pre-assembled at the factory follow a specific assembly process that routes the larger connectors first and breakout cables last. In the field, cables can be removed in reverse order. Undesirable cables can be cut out or left unconnected. Cabling is a much overlooked part of computer and monitor installs – not to mention keeping them waterproof. Often clients shortchange themselves on the placement of the monitors or equipment in the room or area. I know from our experience, at Optrex, efforts are made in insure that all aspects of the install is done right and one right once. Going back to rework and/or refit the equipment is not very fun.